Note the collapsible bipod for use in heavy weapons emplacements. Edit: I just found out this is a fairly collectible piece. 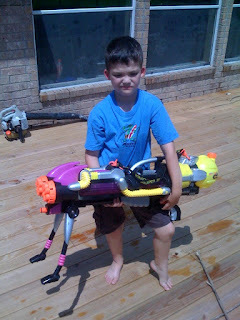 It's the Super Soaker Monster XL, made from 1999-2003 or so, and new ones have sold on ebay for over $100. Yikes. Now do I let him play with it or not? These were even listed in the Guiness Book of World Records as the largest single piece water blaster created. Well, it is his birthday today. Nice find!